Provost Jonathan Holloway. Holloway on Wednesday remarked on the state of the deficit to Faculty Senate for 25 minutes and then answered questions. 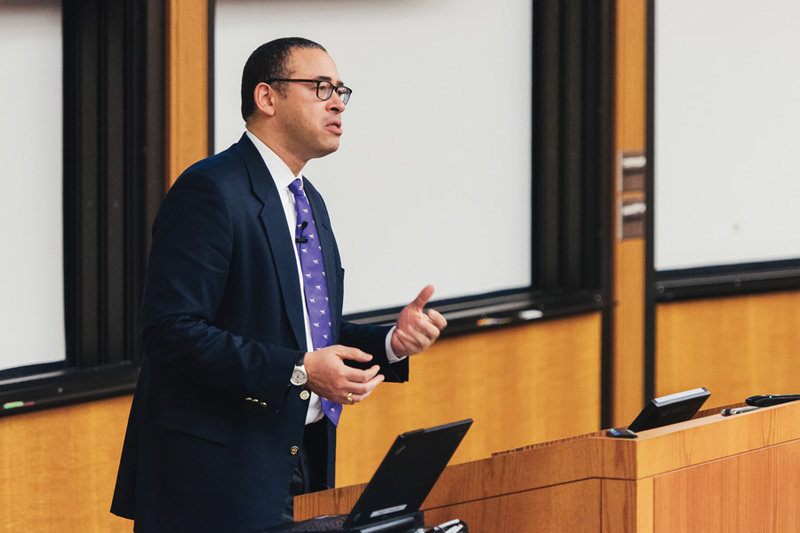 Northwestern is on track to solve its unexpected $62.5 million budget deficit, Provost Jonathan Holloway said at a Faculty Senate meeting on Wednesday. Holloway said he expects the budget will be in a “positive stance” within 12 to 18 months. Holloway spoke about the school’s finances for around 25 minutes at the meeting, highlighting the importance of being transparent about the deficit. The final tally for the deficit is $62.5 million, higher than the original lowest-projected estimate of $50 million. NU laid off roughly 80 staff members and cut 80 funded positions in July. Holloway, who requested to attend the Senate meeting to comment on the deficit, said transparency is important for making robust decisions and building trust. He said when he worked at Yale University, where he was dean of Yale College, the administration was not transparent. “I just wanted to say how much I appreciate your candor and transparency on this,” art history Prof. Claudia Swan said. Holloway apologized for the layoffs resulting from the deficit, which came following a decision to invest heavily in construction projects and academic resources after years of running a surplus. He said communication issues and lack of system notification led to the administration being blindsided. “It certainly was a surprise to me when I joined the University and a few months later we were in deficit,” he said. Academic units, such as different schools, will have to cut 5 percent off their non-salary budget, Holloway noted the cut, intended to alleviate the deficit, will not affect all schools equally. How much the cut will affect each academic unit depends on each dean’s discretion. “Some schools can ride out this two-year moment without any significant effects, whereas some schools are in a situation where, regardless of what year it is, they are always struggling,” he said. At a meeting with reporters on Monday, Holloway said administrative units were asked to cut 10 percent of their budget this year. Holloway also said the school will keep the number of Ph.D. graduate students constant, which may feel like a slowdown for departments that are growing. Holloway’s office is working closely with The Graduate School and Weinberg College of Arts and Sciences — the schools that most rely on graduate students — on incremental changes to ease detrimental effects. Senate President Baron Reed and Senate President Elect Lois Hedman said the reasonable person standard is consistent with common legal practice and would provide the desired objectivity. Hedman said the committee had worked on the revisions for about a year and had consulted multiple legal experts in the Pritzker School of Law who supported the reasonable person standard. A motion to approve revisions to the handbook passed with two nays after Reed clarified that approving the revisions would not prevent changing the handbook in the future.